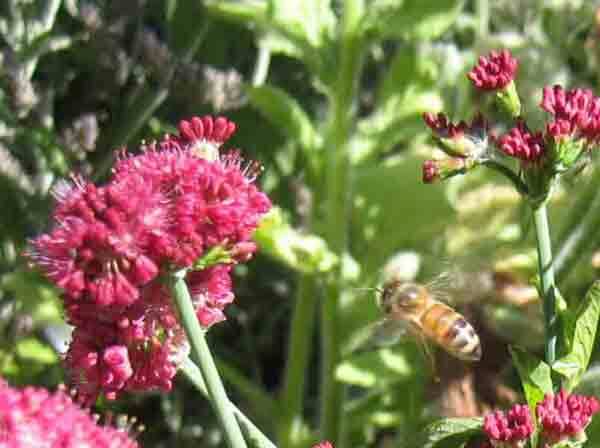 A honey bee approaches buckwheat. Finally, the bees have produced enough surplus honey for us to steal some. This year they have been much more interested in making bees. While increasing the bee population is itself a good thing, we’ve been missing our honey! We didn’t even have any for our own toast! Usually by this time of year we have enough surplus honey to give away as wedding favors or to donate to friends’ mead projects. Not this year. 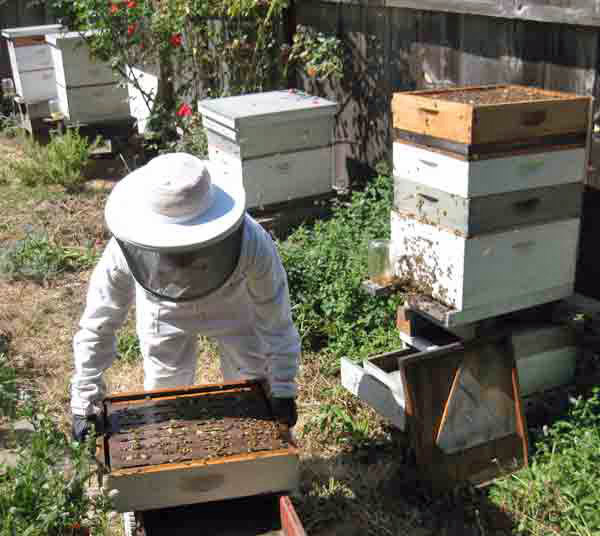 To harvest the honey, we first open the hive and lift off the supers that we want to take. If there is a flow of pollen going on, the bees are quite calm while we do this. They are generally happier when the sun is shining and lots of flowers are blooming. 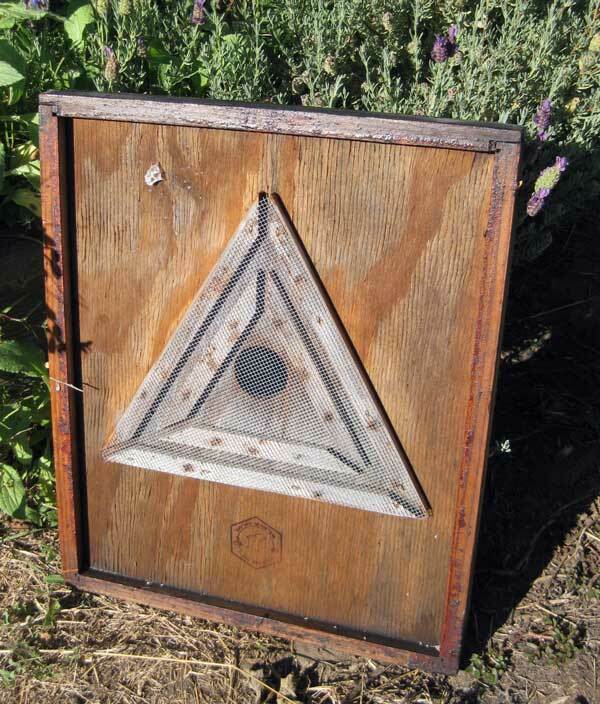 However, if it is cool, or windy or flowers aren’t blooming, or it’s late in the day, the bees will get quite upset with us for lifting off the lid of the hive. Although we are as gentle as possible, gentle on a human scale is devastating to the tiny bee. While the workers are dehydrating nectar and maintaining a constant temperature inside the hive, we invaders are at the very least are letting a huge draft of air in. 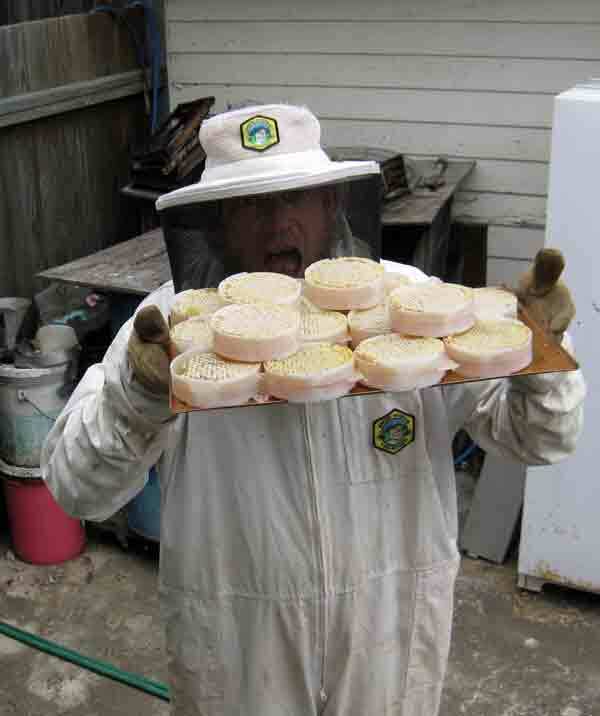 Here I am taking the lid off a tall hive. Setting super aside so I can put the bee excluder under it. Even if many bees are out collecting pollen and nectar, there are many other worker bees left in the super. To separate the bees from their honey, we place a bee excluder under the supers we want to take, put the super back on the hive and replace the lid. The bee excluder allows the bees to get out of the super, but not to return. About 24 hours later we return, take the lid off and remove the super again. This time it will be relatively bee free. We also take off the bee excluder and save it for future use. Often we give the hive an empty super at this time. Once we’ve stolen the honey, we process it as little as possible. Since we find that the tools often used in extracting honey such as a hot knife to uncap the comb and a centrifuge to get the honey out of the comb, changes the flavor of the honey, we don’t do use these tools. Instead we simply cap the honey rounds or let the honey drip through a sieve. The result is honey that is as close to what the bees made as possible. Jeff holds a tray with rounds of bee comb and honey. 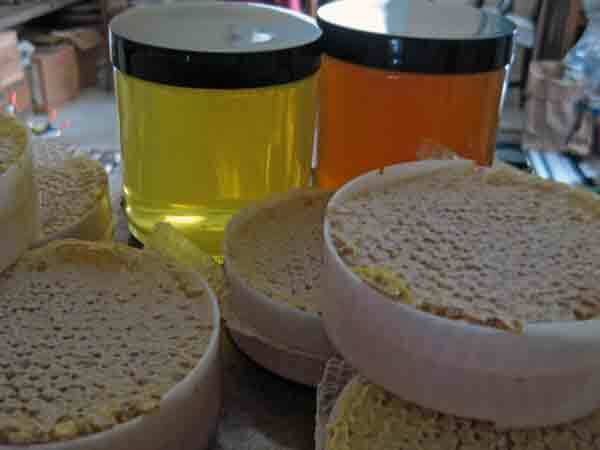 Although harvested at the same time, the honey from different hives, looks and tastes different. 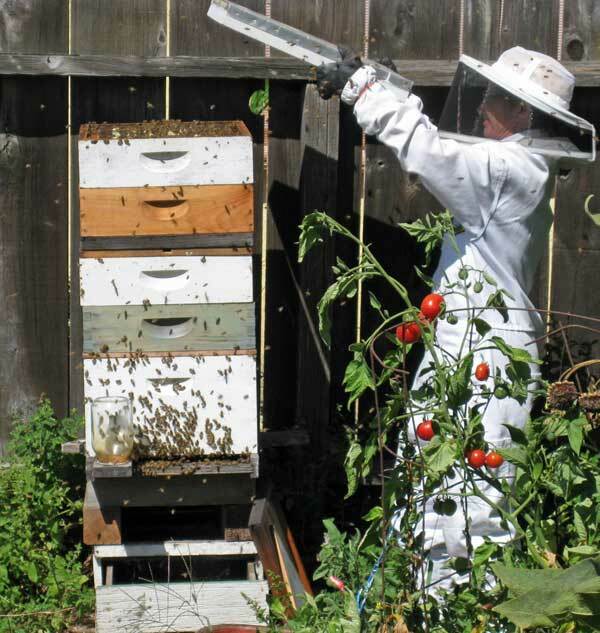 This entry was posted in Bees and Honey and tagged bees, honey, Lanora Cox. Bookmark the permalink. 2 Responses to Finally, a Honey Harvest! I am new to bee keeping. Can you tel me how to make a bee excluder?